As well as creating a home that looks visually stunning and feels great to be in, one of the major priorities for us when designing and refurbishing our spaces ought to be the maximisation of our own comfort. Too often, we get carried away with designing spaces that we think will look good, without actually inquiring with ourselves about what we actually desire. It’s always nice when our living areas look well-appointed from an objective point of view: but do they meet our own intrinsic tastes when it comes to feeling comfortable? Of all the rooms and spaces in the house, it’s our living rooms where we seek ultimate comfort and relaxation, so it makes sense that we design and appoint these interior in the most fetching and desirable way as possible. Most of us can’t think of anything more desirable that kicking back in on our couches, flicking on the remote control, and settling in for a night of riveting audio visual entertainment. As you might be aware, there are so many ways to induce comfort, especially where the TV room and lounge area is concerned. Today on homify, we’re taking a cosy wander through some of the most inviting and alluring TV areas, offering a few salient tips and ideas on how to induce a similar feeling of comfort and allure in your own home too. 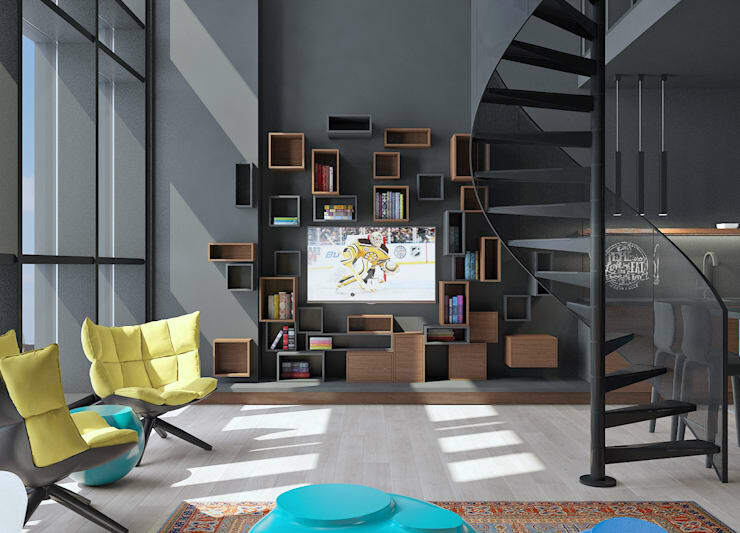 Read on, get inspired, and make the most of your TV, media and entertainment spaces. When it comes to having a fabulously appointed and ultra-cosy TV and entertainment space, there's little substitute for a sturdy, reliable and ultra-decadent couch. A good TV area must fuse visual and sentient stimulation with tactile comfort—without the couch (assuming you have a good TV installed) you’re left with just one of the two crucial ingredients. By all means, a cutting edge flatscreen TV certainly makes a fine addition to a great TV room, but first thing’s first: invest in a gorgeously inviting couch, and work your way from there. The owners of this amazing living room space certainly did here: a gloriously lavish, yet hardly ostentatious room, replete with the wooden flooring, lovely rug, wall-embedded fire feature and bright, fabulous windows. But it's the couch that steals the show here: a delicate balance of 'art piece' and comfort furnishing. Simply add your choice of flatscreen television (and vintage typewriter) and you've got yourself a truly decadent, ultra-comfortable TV setting. It can always be a challenge to negotiate the finer points of interior design, especially where the all-important living areas are concerned. If you feel like you need a little extra advice or guidance on how to make things work in your home, why not have a chat to a professional and let them guide you in the right direction? It’s a good idea to remember that your TV area will likely—in this day and age of fused, multi-purposed spaces—hold multiple functions, and you’ll probably want to design your space accordingly. Versatility is crucial for a fully functional, comfortable TV space, and one of the ways to induce this is through the use of lighting. With a neat blend of natural and artificial light, your TV area will look fantastic and feel fantastic, whether morning, noon or night. It's certainly the case for this fabulous example: a TV room room with all the right trimmings: decadent couch, fabulous in-built entertainment system, fireplace for the cooler months, and, of course, a brilliant installation of artificial ceiling lights, fusing harmoniously with free-flowing, gorgeous natural light. Who wouldn't want to while away a few hours here every night? Speaking of fused spaces, here we have another fine example of what's possible in the modern home. 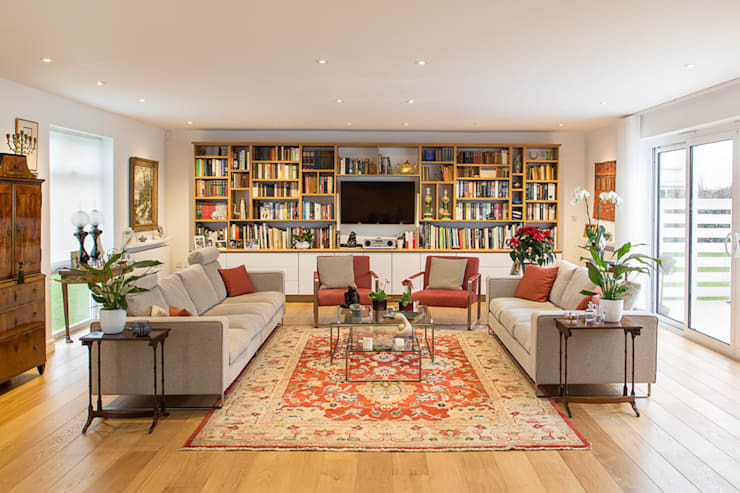 This space is, in many ways, multiple rooms in one: a study, reading room, living room and TV entertainment area all in one fabulously united setting. With a bit of design nous and sense of proportion and balance, you can design a space that fulfills just as many functions. Here, the TV is neatly embedded in the rear library wall: present, but not overbearing. The couches and sitting area stands alone, but can easily be transformed into an entertainment station coming the evening time. If nothing else, this is a great example of how truly versatile a TV space can be. 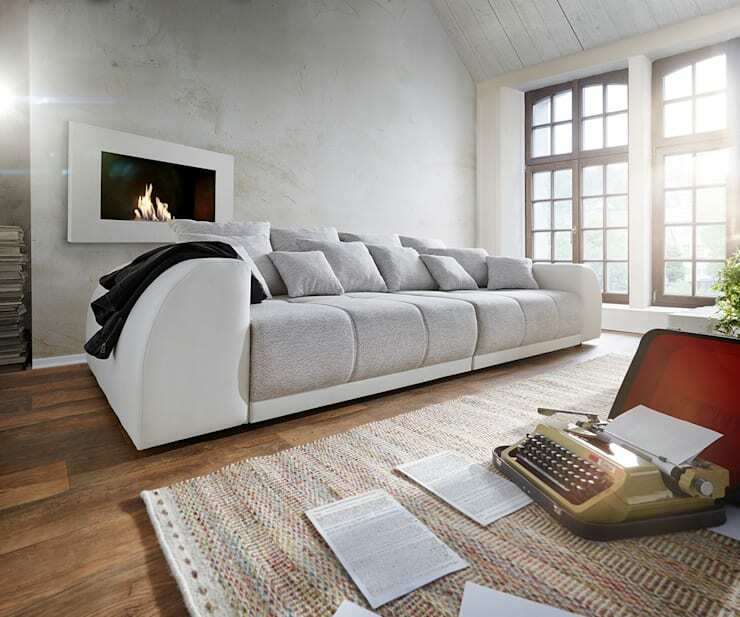 Some might prefer the cosier option when it comes to inducing a sense of comfort in their TV areas, but cosiness comes in a lot of forms, and can be induced jsut as fabulously in a broad, open area too. 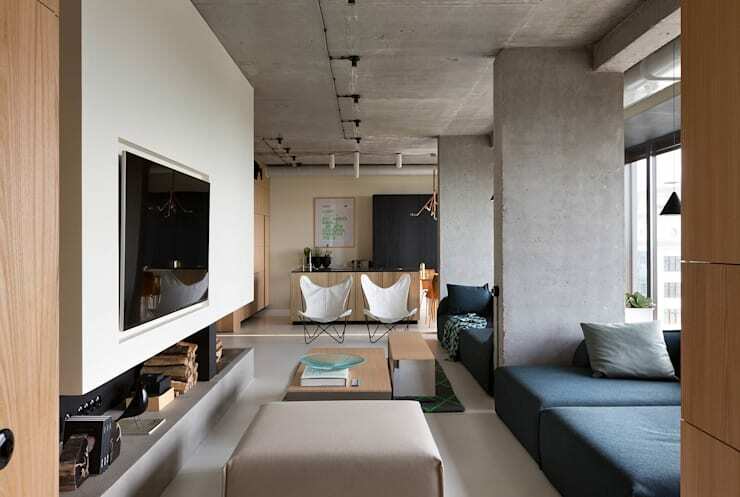 For interior spaces blessed with abundant room, creating a sense of allure and invitation can be as easy as this brilliant example: a fantastic, airy, well-lit and contemporary-appointed loft-style apartment space. With a fusion of dark wall tones and light-hued wooden flooring, all that's needed to create comfort here is a splash of modern colour to the chairs and resting points, and an artistically-affixed array of shelving to accompany this brilliant flatscreen television. Proof that light and spacious can create cosiness and comfort just as easily as a more cloistered and contained space. Simple additions can make all the difference to an aesthetically pleasing TV room, and often so much of this work can be done by attending to the walls. Here, a flatscreen TV is far from alone, and benefits from company in the form of a series of well-selected and thoughtfully-placed paintings, hangings and curios. A little objet d'art can freshen up a space and give it added depth, charm and personality. Today, we have more or less every variety of audio visual technology at our disposal in our bid to create the most dazzlingly cinematic home entertainment spaces possible. 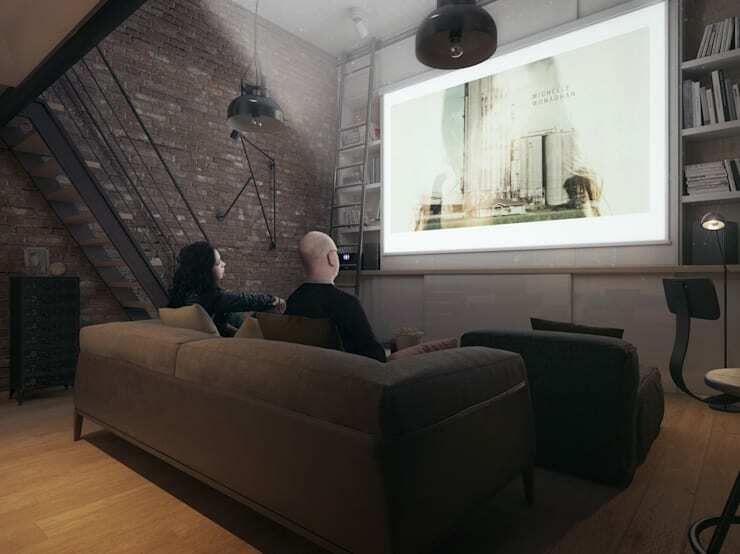 With fabulous, and rather cost-effective, projection technology, as well as cutting edge stereo speaker systems and all the trimmings of a fully-functional cinema complex, we can truly live the dream and install our own cinemas in the comfort of our own lounge rooms. This is a neat example of what can be achieved: a highly desirable, ultra-comfortable and magnificently inspired feature media room. Simply dim the lights, find your groove in your neatly selected centerpiece couch, and drift off into the magical world of film and entertainment anytime you like, with a brilliant home TV projector, screen, and all the additionals. Did you like that Ideabook? There's plenty more inspiration to be had—keep the ideas flowing with a look at 7 steps to an individual living room?